From Interstate 77, Exit 5 At Exit 5 turn onto SC Hwy 48 East/Bluff Road. 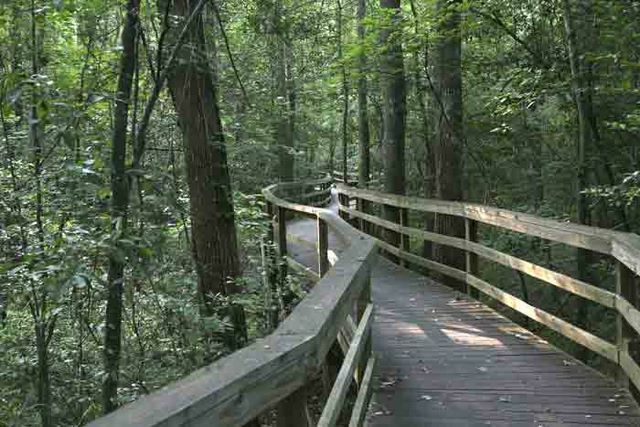 Following the brown and white "Congaree National Park" directional signs, travel approximately 8 miles on and then take a slight right onto Old Bluff Road. Follow Old Bluff Road for 4.5 miles to the park entrance sign, which will be on the right. Proceed one mile to the Harry Hampton Visitor Center. Parking lots will be on the right. Note: If you go in the summer, be sure to take plenty of water and bug spray. Best time is early (early) morning. Not as hot and the bugs are at a minimum.